The innovative design of the Premier Boundary Water Meter Box sets this box apart at a higher standard of Boundary box from all other plastic covered Boundary Boxes. The advanced features of the Premier Box which are critical for a long extended service life include a polymer cover that is up to six times stronger than conventional plastic covered boxes. With modern electronic data collection a polymer covered boundary box is very important as the AMR Radio signal transmits through a polymer cover without interference as opposed to a radio signal that is blocked through a cast iron covered box. Also there is a hidden treasure buried with each installation of a Premier Boundary box. This manifold is of superior design with minimum joints. This is achieved with the high cost specialised injection moulding tooling. At water conferences throughout the world a popular topic is water leaks. This hidden treasure of the Premier manifold with minimum joints addresses this topic. Also in its design a straight through modern design ¼ turn stopcock ball valve is fitted and greatly reduces head loss. The Manifold which also includes a non-return valve is designed to 16 bar working pressure. The material used to manufacture the manifold is a 2.5 MFI (Melt Flow Index) acetal material. This material is most suitable as it gives the best dimensional stability when water pressure is applied. 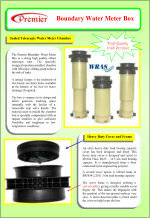 The manifolds accept the standard concentric water meters and are robust in design. 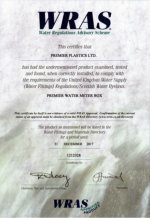 The Premier Boundary Water Meter Box is a very strong, high quality robust completely sealed telescopic unit. The telescopic adjustment of the meter box chamber allows the height of the box to be easily adjusted from 56cm to a maximum of 86cm. The 7 degree variable tilt allow the top of the meter box align with the gradient of the top ground surface. The material used for the specially designed one-piece injection moulded chamber and guard is specially compounded with an impact modifier added to give sufficient flexibility and toughness to withstand cracking in low temperature conditions. Also the inclusion of two knock out drain holes available at the bottom of the specially moulded chamber allow self drainage if required. The box is compact in its design and offers generous working space internally with the facility of a removable stop valve handle. This allows extra space in the large box during installation of water meters and electronic equipment. Excellent access and visibility to both stop valve and meter is provided through the top opening. 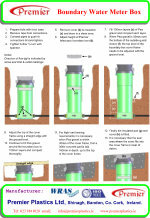 A 30 mm closed cell insulation layer is fitted over the meter and electronic equipment to aid as frost protection. The Premier Box sets itself apart from the traditional light grade plastic covered boxes as this Premier Boundary box has a cover lid that is up to six times stronger load bearing capacity. Think about it the Premier Box cover is up to six times stronger. This is why the Premier Box cover achieves the higher grade B in the BS5834 Part 2 International standard for load bearing capacity as compared to the traditional weaker light plastic covered boxes. The traditional weaker light plastic covered boxes are specified for BS5834 Part Grade C suitability. This grade C Standard states, that they are only suitable in footpath areas with access only by pedestrians and cyclists. The stronger Premier Boundary box polymer cover is tested to over 8 tonne load bearing capacity and is suitable in the above category but it also complies with the requirement of the higher standard BS5834 Part 2 Grade B where vehicles have access. Similarly also the Premier Box cover can be made to comply with the higher grade EN124 Class B125 international standard. It is important that the correct load bearing capacity covered boxes are installed. Light covers if fitted where they can be broken by traffic and do not comply with international standards and best practice pose a direct risk to the general public. This leaves the owner and the installer with potential liability in their duty of care. A BS5834 Part 2 Grade B medium grade covered box such as the Premier boundary box is what needs be installed where vehicles have access. An alternative is a cast iron covered box but the metal will block the radio signal. Some radio signal will get out through the ground around a cast iron cover but depending on the type of soil material and if the ground is wet or not, only weak levels of signal will get through. As the battery in the electronic unit gets older the signal will also get weaker. This type of intermittent radio signal would be detrimental to the efficient reading of electronic data. From an owner and installer viewpoint the Premier Boundary Box is very competitive and represents the best whole life cost on the market for Boundary Boxes in vehicle access locations. The Premier Box is easy to install and operate. The units can be installed as retrofit or in new installations. The Premier box is designed to comply with WIS (Water Industry Specification) 4-37-01 Class 1, water tightness specification. 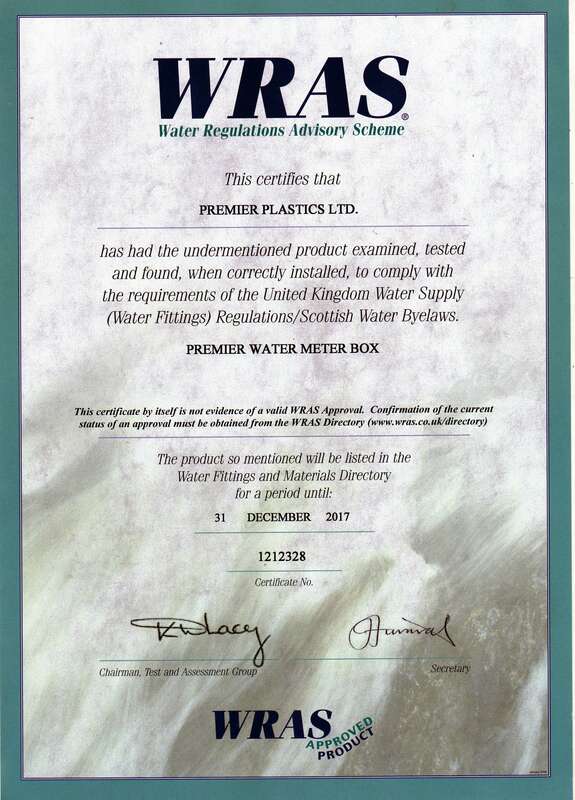 Premier Plastics Ltd, is an ISO 9001 Quality management System Certified Company and the Premier Boundary water mater box is a WRAS approved product. The strong Premier Box sets itself apart as being at a higher standard than traditional light plastic covered boxes. The superior Premier Box has a high load bearing capacity cover allowing Radio signal through without interference and also the manifold with minimum joints in its design helps to prevent leaks. This manifold is enclosed as a hidden treasure in the bottom of every Premier Boundary box installation. Premier Boundary Box; Patent Pending. 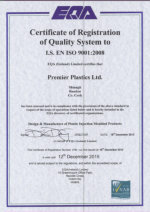 ©Copyright of all technical drawings of product, are owned by Premier Plastics Ltd.